The Elite Montage, by Lennox, the makers of the Whitfield pellet stove, can be customised with four different trim sets. I particularly like the 'Gothic Arch' cast iron door trim. The glass in this stove's viewing window is reflective ceramic, which means that when the stove is not alight, the interior cannot be seen. When the stove is lit, the view of the fire is normal. Window Size 9.2" by 9.6"
The viewing window is quite small by modern standards. The Elite Montage pellet stove is not particularly well designed for ease of maintenance. The manufacturers advise that certain aspects of routine maintenance should only be undertaken by qualified persons, although there are detailed instructions in the manual. The burn pot and its air holes should be cleaned between one day and two weeks as necessary. The ash slide pate should be opened and the ashes brushed into the ash pan from the firebox every day or up to two weeks as needed.The ash pan should be emptied every two days or up to two weeks. The heat exchanger should be cleaned once every two days to two weeks using the built in scraper. While the scraper is in the 'out' position, the area around the heat exchanger tubes should be cleaned with a small bottle brush. The flue passageways in the stove should be cleaned every one or two months. This means removing the firebrick panel by unscrewing its retaining brackets. The baffle plate should be removed and the rear stove compartment should be cleaned once a year, the door and window gaskets inspected, the blowers removed and cleaned, the window wash vents brushed out, and the flue checked and cleaned if necessary. 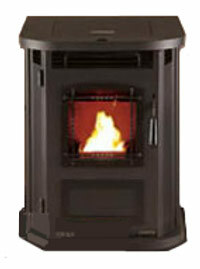 If you would like to leave a review of the Elite Montage pellet stove, please use the form on the contact page.